Going off on a camping trip into the wide blue yonder may seem an idyllic break from the humdrum of everyday life! Wide open spaces or beautiful forests may be your idea of the perfect getaway, but you do tend to give up on some of life’s luxuries, like a fully-equipped bathroom! But getting clean is not an impossible task! You can take a basin and a wet rag to do the job, or opt for a portable hot water shower. You can even opt to add a shower tent if the idea of the local wildlife taking a peek at your naked body does not appeal to you! 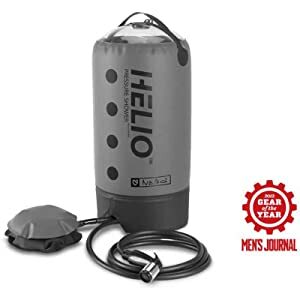 So, without much ado, let’s take a look at a few of the best portable shower’s around, their pros and their cons, and a few other details that you need to keep in mind about them. 4 What do you need to look out for? This is a neat, versatile, little shower that can serve a number of purposes. 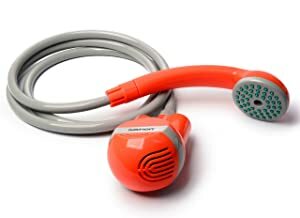 You can use it as a shower, to water your flowers, or even to get water out of your bath if you have plumbing problems! Added to this that it is battery operated, you are sure to have a warm (or cold) water shower anytime you need one. With a waterproof battery system that is not in your water receptacle, this product with its built-in water filter system allows you to even get clean with lake water if you don’t want to heat your water and are brave enough for the cold. Portable and convenient, you can use this shower wherever there is water! This makes it a great option for any and all outdoor activities. Easy to use for any lover of the great outdoors, or to use at home for when the plumbing gives up on you. This portable outdoor shower can even be used indoors – consider using it to rinse off your little one while he is in his baby bath tub! 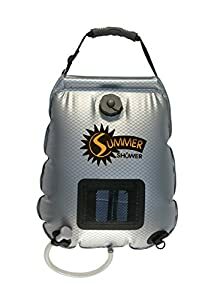 This 5-gallon solar shower is a great accompaniment when camping or for those times when the geyser decides to break! All you need to get hot water is some sunshine! The Summer Shower is a great choice when you are looking at some of the best solar showers around. This solar powered shower’s construction ensures optimum heating – fast – while the on/off shower head switch allows for water saving. The little extras added in the design make this a great option! Made of high-quality materials, the Nemo Helio Pressure Shower folds up compactly, is light, and relatively easy to use. 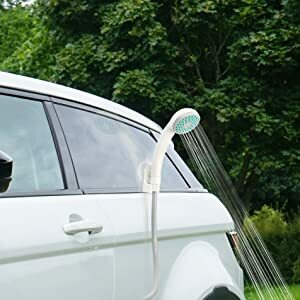 While great for showering, it is equally great for use when washing dishes while camping. A great system that includes an 11-liter tank and all the trimmings, you are ensured constant water pressure due to a foot pump while the handy thermometer ensures you r water is exactly the right temperature every time. This innovative, quality product is great for use in rugged areas where showering facilities are at a minimum. The included tripod and stove are a convenient addition as it could be used for outdoor cooking. Before buying a camping shower, know your needs! Is size a factor and how much space does it take up in your vehicle? Are you going to have easy access to water, or do you need to take water with you on your trip? Do you want to take something along to heat your water? Most of the best portable showers actually add a lot of benefits to any camping trip. 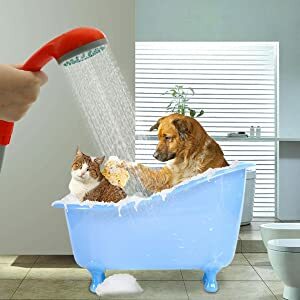 Not only do they keep you clean (I know I feel great after taking a shower and getting rid of the dirt, grime, and sweat), but can be used when cleaning dishes or other outdoor equipment. Besides that, you can use it around the home to clean your pet, your car, etc. An outdoor shower also means you are not limited to where you go camping – you can go off into the wilderness where there are no ablution blocks and other such ‘tame’ facilities while enjoying the luxury of a warm shower at the end of the day. There are a number of questions you need to consider here as well. 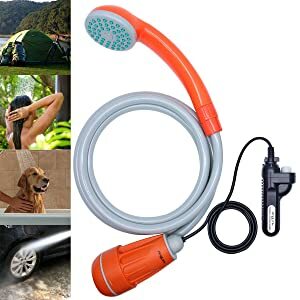 If using a battery operated portable camping shower that needs a USB connection, how sure are you that your power source will be readily available? If going for a solar shower, what time of year is it? Are you sure there will be sufficient sunlight to heat your water? 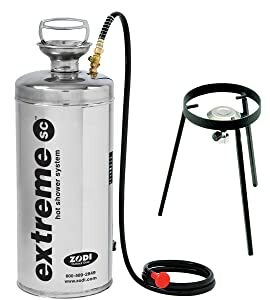 If opting for a shower that needs an external heat source, how viable is lugging such heavy equipment around?Or are you going to be camped in one spot only for an extended period? So you have decided on which is the best portable camping shower for your specific needs. Great! So what are the best practices to follow when using it? 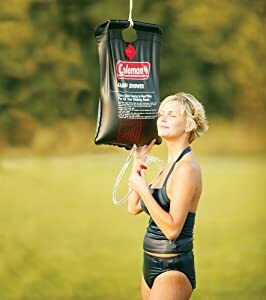 Firstly, most portable solar outdoor showers need the water reservoirs situated quite high off the ground as they make use of gravity for the water to flow out. So make sure you set it up in a spot where the water reservoir can easily be hung. Portable showers that have a water pump are easily operated out of any kind of holder, whether it is a bucket, a sink, or even a lake! Most also tend to heat the water. Do ensure, however, that the pump is taken out of the water when not in use. Portable showers with a water reservoir of stainless steel commonly need gas to heat up. Do make sure your gas bottle is tightly closed when not in use and stored somewhere safe. A leaking gas bottle is a fire hazard. There is no denying that having a warm shower at the end of a (outdoors camping) day is relaxing, and there is nothing as great as climbing into bed feeling clean. To choose the best portable shower, i.e. one that stands out from the rest, was a daunting experience, as each of those reviewed had their own specific pros that made it stand out. But, for the sake of luxury and ease of use, the Advanced Elements 5 Gallon Summer Shower takes the lead. With the extras included, i.e. special soap, shampoo, and washcloth holder, this one is the way to any camping girl’s heart!